Rice farmers in the northeast Indian state of Assam have achieved yields of up to 3 - 4 tons per hectare using the Swarna Submergence-1 (SS-1) submergence-resistant paddy Seeds, which are an updated version of India's popular flood tolerant hybrid rice variety 'Swarna'. The average rice yield in Assam stands at around 1.93 tons per hectare, while the national average during is around 3.5 tons per hectare. However, floods often destroy the entire rice crop in flood-prone regions of Assam. The Assam Agriculture Department (AAD) began experimenting with the SS-1 seeds by distributing around 17,000 kilograms of seeds to farmers in the state's flood-prone districts during the June - July cultivation season in 2012. The state managed to produce 5.2 million tons of rice during FY 2012-13 (April – March) and farmers were impressed with this flood-tolerant variety. With increased output, the AAD has expanded the SS-1 variety usage to 40,000 hectares of land mostly in flood-affected areas. With the SS-1 seeds, the AAD expects to produce about 6.1 million tons in the FY 2013-14. SS-1 seeds were developed by the Philippines-based International Rice Research Institute (IRRI) in collaboration with the Indian Council of Agricultural Research (ICAR) in 2009. Scientists modified the 'Swarna' variety by introducing gene Sub1 (for submergence) that helps plants survive under water up to two weeks, yet give higher yields. The seeds have been tried in coastal districts of India's southern states Andhra Pradesh and Odisha, which are mainly rained lands and are prone to floods. Scientists say the yield advantage of SS-1 variety increases as flood severity worsens and can increase the yield up to 66% even after 13 days of flooding. The SS-1 seeds can yield up to 3 - 3.5 tons per hectare when submerged for 13-15 days and up to 6 tons per hectare in normal conditions. A farmer in Dakshina Kannada is proud to own 80 varieties of paddy, most of them being traditional ones. B.K. Deva Rao of Mittabagilu village, 16 km from Ujire, now sows them on rotation basis on 42 plots spread over six acres on the foothills of the Western Ghats. He cultivated 40 varieties from April to October and the other 40 from October to March. Hence, all were saved. According to him, he used only “hatti gobbara” (organic manure) to grow them. The paddy in his possession includes not just the ones cultivated in the coastal belt but also elsewhere. It includes some hybrid varieties as well. Pointing out at a Manipuri variety, Mr. Rao told The Hindu that the grain was light blue in colour. A doctor had given him a Thailand variety called “Jasmine”, he said. Mr. Rao said that till 1979, he had grown 40 varieties of paddy. It was from then that he started using chemical fertilizers till 1988 as the government introduced hybrid varieties such as IR-8, Jaya and Shakthi during this period. As the focus shifted to hybrid varieties, sowing traditional ones lagged behind. Hence, the stock of varieties came down to nine. During this time, he observed that the soil had turned hard due to the use of chemical fertilizers. Subsequently, Mr. Rao said, he switched to natural farming and after 2000, he started collecting varieties that he had lost and the ones which were not in his possession. Mr. Rao said that some of the traditional varieties such as “Samunga” or “Kumkuma” were still not available. “Kolanjipille” and “Jeerigesale” varieties are also lost, he said. Some of the varieties in his possession are “Meese Bhatta”, “Kalame”, “Atikaya”, “Raja Kayame”, “Suggi Kayame”, “Tonnur”, “Navara”, “Gandhasale”, “Aden Kelte”, “Gidda Bhatta” and “Shasthitka (a two-and-a-half month crop). His son, B.K. Parameshwar Rao, a mechanical engineer-turned-agriculturist, said that usually paddy seed lost full germination capacity if stored beyond eight months after harvest. Hence, they would have to be sown annually to preserve quality. Mr. Deva Rao has received awards and felicitations from government departments and non-government organisations for his attempt to preserve paddy varieties. अब 30-40 प्रतिशत ज्यादा होगा धान! The Philippines-based International Rice Research Institute (IRRI) is developing a new variety of rice, "3-in-1"climate tolerant rice, which can tolerate flooding, a prolonged dry season, and saltiness near coastal areas, according to local sources. According to the IRRI, the new variety will be a climate-resilient variety and help mitigate climate change and sustain agricultural productivity in rice-producing countries. The IRRI first developed the “2-in-1” variety, which could tolerate flooding and drought situations. Flood resistant variety "IR 64 Sub1" was derived from an Indian rice variety. Scientists isolated the SUB 1A gene and identified the genetic code that controls submergence tolerance. The SUB 1A gene activates when the plant is submerged, making it dormant and conserving energy until the floodwater recedes. The "IR 64 Sub1" can tolerate flooding for 14 days and still can produce an average yield of 6.4 tons per hectare. The drought-tolerant variety "Sahod ulan" was derived from the Indian variety "Sahbhagi Dhan" and the Nepal variety "Sookha Dhan". The IRRI scientists identified quantitative trait loci (QTLs) genes which give the drought-tolerance and improve yield. These are activated in popular varieties like IR64 to produce better yields even in drought conditions. Now the IRRI is in its last stage of developing the "3-in-1" variety. It is developing seeds that have genes that can sustain climatic changes and yet provide good yields. IRRI's Deputy Director General says IRRI is working closely with the Philippines Department of Agriculture and the Philippine Rice Research Institute (Philrice) to help the government attain its rice self-sufficiency target. The IRRI promises technology support to the Philippines to accelerate high-yielding varieties, he adds. The country has to unlock the potential of non-conventional methods, including new hybrid variety seeds, genetically modified crops and effective crop management system, to meet the future foodgrain requirements, said Padma Shri EA Siddiq, former vice chancellor of agri-research body ANGRAU. "With the climate change already costing farmers with decreasing crop yields (up to 10 per cent) and new crop land constraints, efforts should be made to develop hybrid varieties that can withstand physical stresses, including water submergence during severe monsoon, drought and high salinity," said Siddiq, who is now honorary director of Institute of Biotechnology, Acharya NG Ranga Agricultural University (ANGRAU), Hyderabad. Supported by the Melinda Gates Foundation, world scientists are re-engineering photosynthesis aspect in C3 cultivated variety of rice to combat the affect of climate change. "The new C4 rice variety would see changes in anatomy, biochemistry, and would see increased yields of up to 50 per cent and improved nitrogen use efficiency," Siddiq said. The foundation is also helping scientists develop high-yielding Green Super Rice (GSR) suited for tropical countries of Asia. "Till now, the irrigated area, accounting for only 35 per cent of the total cropped area was acting as an anchor to our claims of higher food production. However, hybrid technology has to be utilised to achieve higher production in the larger rain-fed area," he said. According to him, we could simply add 30-40 million tonnes (mt) to our foodgrains production by employing hybrid technology varieties in the rain-fed area without bringing additional area into the system. "In India, we've under-exploited hybrid technology in rice, mustard seed and pigeon pea among others. We have to try crop biotechnology to overcome difficulties that cannot be mitigated by conventional approach," he said. He said China had already embarked upon a mega project for breeding super rice varieties and hybrids for raising yield in paddy to 15 tonne per hectare. China has employed hybrid varieties of rice in 20 million ha since 1990s, as against India's 2.01 million ha, by taking advantage of parental lines of International Rice Research Institute (IRRI), Philippines. The country had to produce around 460 mt of foodgrains by 2050, up from the current 257 mt, he said. India's total food grain production rose from 51 mt in 1950 to 257 mt now. Despite this, around 240 million people in the country do not get proper access to food. To adjust this gap, the country has come up with the Food Security Act to provide foodgrains at subsidised rates. India’s Kerala Agricultural University (KAU) has developed new hybrid rice varieties that have higher yields and are more nutritious compared to other rice varieties in the southern state of Kerala. According to KAU’s project coordinator Prof. S. Leena Kumary, the new rice variety Mo.16 (Uma) has an average yield of around 6 - 6.5 tons per hectare which can increase to 8 to 9 tons per hectare under favorable conditions. The rice variety Mo.21 (Prathyasa) has an average yield of around 5.5 – 6 tons per hectare. The yields of these varieties are about 2 – 3 times the national average yield of around 3 tons per hectare. The new varieties have good milling rate (of around 65%) and cooking quality. Mo.21 has higher content of zinc and is more nutritious than other varieties, Prof. S. Leena Kumary told Oryza. Rice consumption in Kerala stands at around 3.8 – 4 million tons, but the state produces just about 600,000 tons of rice annually due to lack of irrigation and low hybrid rice cultivation. The existing varieties of rice take more than 120 days to take to reach the harvest period. “The aim is to reduce the sowing-reaping cycle to around 100 days, without affecting the yield using seeds that have good resistance power,” Devika said. The state government had allotted `5 crore for setting up the germplasm laboratory in the research station, but the finance wing is yet to transfer the fund. The germplasm unit was therefore developed using the fund allotted by Kerala Agricultural University. హైదరాబాద్‌, మేజర్‌ న్యూస్‌: ఆధునిక సాకేంతిక పరిజ్ఞానంతో కొత్త వరి వంగడాలను రూపొందిస్తున్నామని వీటితో అధిక దిగుబడులు సాధించ వచ్చని వక్తలు పేర్కొన్నారు. శుక్రవారం రాజేంద్రనగర్‌లో డైరక్టరేట్‌ ఆఫ్‌ రైస్‌ రీసెచర్చ్‌ ప్రాంగణంలో ఇండస్ట్రీస్‌ మీట్‌ జరిగింది. ప్రభుత్వ, ప్రవేటు భాగస్వామ్యంతో వాతావరణంలో మార్పులకు అనుగుణంగా కొత్త వరివంగడాలను రూపొందించ వచ్చని అధికారులు విక్రామత్‌, శోభారాణి, హరిప్రసాద్‌ పేర్కొన్నారు. అంతకు ముందు 1000 రకాలతో కూడి వరి వంగడాల ప్రదర్శన జరిగింది. ఇందులో 250 వరి వంగడాలను మాత్రమే రైతులు వినియోగిస్తున్నారు. వాటిలో ముఖ్యంగా సొనా మసూరి, బీపీటీ, 5204 వంటి రకాలను మాత్రమే రైతులు అధికంగా ఉపయోగిస్తున్నారు. ఈ కార్యక్రమంలో వ్యవసాయ ఉన్నతాధికారులు, రైతులు పెద్ద ఎత్తున పాల్గొన్నారు. Rice varieties that can adapt to climate changes are being studied and bred at the International Rice Research Institute in Los Banos, Laguna. IRRI is crossbreeding tolerant varieties such as the Salinas that can grow on saline seawater; the Sahod Ulan, a type suitable for rain-fed farms; and the flood-resistant variety Submarino. Crossbreeding of Salinas and Submarino is underway, said Dr. Glenn Gregorio, senior scientist and rice breeder at the IRRI, adding that the result of the combination is a variety that is both capable of withstanding saline water and rain water. A variant that is both drought and flood tolerant has also been recently developed, he added. “We call it dual tolerance. Pinagko-combine na namin yun kasi yung mga farmer, sinasabi nila, nagkakaroon sila ng drought tapos after that, babahain naman sila,” he said. 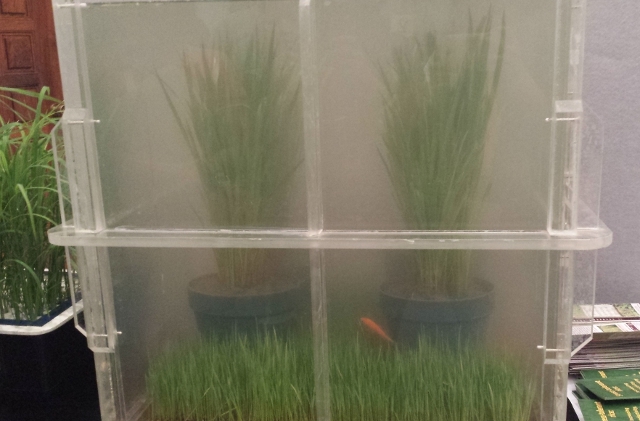 Ways to develop rice varieties of triple tolerance – saline, submergence, and drought – are being tested in IRRI’s laboratories. Another is a variant nicknamed spice rice, for its ability to withstand heat, salty water, and a very dry weather. The changing weather patterns brought about by climate change cause a variety of unfortunate scenarios that all lead to low yield. Thus, a rice variety that is tolerant to only one kind of scenario is not enough. There are rice varieties that are naturally flood-resistant, saline water-tolerant, and drought-resistant. But naturally, these varieties produce low yield. Scientists crossbreed these varieties to high-yielding rice varieties. With the new technology being used for crossbreeding, scientists can produce a new varieties in three to four years. What takes longer is the field testing that takes about four to five years. This is to make sure the new crops are both high yielding and are safe for consumers and farmers, Gregorio said. Salt-and submergence-tolerant rice is in its second year of field testing in the Philippines, India, Bangladesh, Vietnam, and Thailand, among other countries. Submergence-and drought-tolerant rice has only recently been developed and will be field-tested soon. “[Nasa IRRI] pa lang. Ngayon, ilalabas na,” Gregorio said. Meanwhile, seeds of Salinas, Sahod Ulan, Submarino and other singly-tolerant varieties are available in PhilRice, IRRI, the Department of Agriculture, the Bureau of Plant Industry, and several local government units, either for sale or for free distribution. IRRI gives one to two kilos of hybrid seed varieties to farmers who would like to try planting them. IRRI’s Rice Germplasm Bank that stores more than 100,000 varieties of rice can give around five to 10 grams of traditional varieties such as Milagrosa, and Azucena to farmers as well. Washington: In a quest to feed the world's spiralling population as climate change worsens, Japanese biotechnologists have developed a rice plant with deeper roots that can sustain high yields in droughts that wipe out conventional rice crops. A team led by Yusaku Uga of the National Institute of Agrobiological Sciences in Tsukuba, Ibaraki Prefecture, described the finding of a remarkable gene in a rice plant cultivated in the dry uplands of the Philippines. This rice strain has roots that are deep and grow straight downward, boring into parched soil for water, as opposed to root systems that are shallow and grow out laterally in typical water-rich paddy fields. The gene for this called "deep rooting"- dubbed DRO1- was spliced into a cultivar called IR64, a paddy rice plant grown around Asia. The team then put the new plant through its paces, planting both it and standard IR64 in upland fields in three kinds of conditions- no drought, moderate drought and severe drought. Moderate drought reduced yield of IR64 to just 42 percent in no-drought conditions. Severe drought destroyed it. But IR64 with the DRO1 gene was almost unaffected by moderate drought. In severe drought, yield fell - but not catastrophically - by around 30 percent. The Kenya Agricultural Institute (KARI) has developed a new rice variety, IR522, in collaboration with the International Rice Research Institute (IRRI). Scientists involved in project claim that the new rice variety consumes up to 70% less water than most other varieties, and has a protein content of up to 40% more than in most Asian and African rice. They say that the yield of IR522 is high and the new variety could help Kenya reduce its dependency on rice imports significantly. Currently, Kenya produces only about an eighth of its total rice consumption of around 480,000 tons. According to the Ministry of Agriculture, annual consumption of rice in the country is expected to increase at a rate of 12% due to growing popularity of rice. RANCHI: After almost a decade, the Jharkhand state seed subcommittee released nine high-yielding varieties of rice, groundnut, soya bean, sugarcane and chickpea crops, following a notification by the Government of India last month. These are resistant towards major diseases and pests. The release got a final nod from the committee chaired by Arun Kumar Singh, the principal secretary of agriculture and cane development. M P Pandey, vice-chancellor, Birsa Agriculture University (BAU), who is a member of the committee said, all these varieties will be notified by the Central Seed Committee of the Government of India for planned multiplication during coming seasons to ensure that they reach the farmers soon thus enabling them to derive the benefits of enhanced productivity and income through its cultivation. "This will pave the way for a second green revolution in the state because the new variants are not only high yielding but also resistant to diseases and pest, making it profitable for the farmers," he said. Four of the nine crop varieties that have been released are of rice alone. Of these, Birsa Vikash Sugandha-1 matures in 120 -125 days and is suitable for cultivation under rainfed conditions of Jharkhand. It is a scented variety of grain with a yield potential of 40-45 quintal/ha. The rice is moderately resistant to brown spot, blast diseases and gundhi bug pest. Birsa Vikash Dhan-203, developed by hybridization between IR-36 and Kalinga-3 variety, matures in 115-125 days. The variety with long, slender grains and 40-45 quintal/ha yield, is moderately resistant to blast; bacterial leaf blight, brown spot diseases, stem borer and gandhi bug pest. Birsa Vikash Dhan-111 is a variety that matures in 80-95 days flat though the yield is comparatively lesser. It is estimated to be at 20-25 quintals/ha. It is suitable for direct seeding in uplands under the rainfed conditions of Jharkhand. The grains are long and slender and the variety is resistant to blast and brown spot diseases and gandhi bug and stem borer pests. Lalat rice variety originally developed by Orissa University of Agriculture and Technology, Bhubaneshwar was released for Jharkhand owing to its suitability to soils and climate of this state. This long-grain variety yields 40-45 quintals/ha and matures in 115-120 days. Pandey said, "While most of the varieties have been developed at BAU, Birsa Safed Soyabean-2, with an estimated production of 25 quintals/ha matures in 105-107 days. This variety has 40% protein and 17% oil content." Two scientists of Acharya N.G. Ranga Agricultural University Research Station (ARS) here have developed two paddy seed varieties, MCM 100 and MCM 101, which can grow in saline soil. The 12-year research of the experts in developing these seed varieties has revived the hopes of farmers having saline soils. In 2011, Directorate of Rice Research, Hyderabad, tagged MCM-101, a rabi season seed, as the second best variety among the 33 paddy seed varieties developed by the other scientists in India, ARS Principal Scientist T. Anuradha told The Hindu . As a part of testing for the second consecutive year, the seed with 125-day duration (MCM-101 variety) was sown in five locations in Andhra Pradesh in saline fields. “We noticed that the fine quality variety withstood the ‘blast’ disease and reported better quality yield than MTU-1010, a leading rabi seed variety in Andhra Pradesh”, said Ms. Anuradha. The kharif seed MCM-100 was tested in ten locations including West Godavari, Krishna and East Godavari, in 2012 kharif. When compared with the leading MTU kharif variety seed, the MCM-100 yield was five per cent higher. “About 6,075 kg. yield per hectare was recorded from this variety as against 5,850 kg. for MTU variety. The average yield of our seed in all the ten locations was 5,539 kg. as against 5,269 kg. of MTU,” said Ms. Anuradha. The crop duration was 140-145 days. “The response from the farmers, who are growing and tested the mini kits of the seed, is the real certification for our work and a Himalayan achievement,” said scientist K. Nagendra Rao, another scientist in the research on ‘Development of Saline Tolerant Rice Varieties for Coastal Andhra Pradesh’. The MCM-100 and 101 seed varieties are exclusive seeds those were developed for saline soil, which is in large extent in the State and is not suitable to grow with the existing paddy varieties. “The scientists aimed at developing seeds meant for saline soils, but these two varieties will also give yield much higher than present leading varieties – MTU 1061 and BPT 5201 – if farmers grow in normal soils,” claims the scientist duo. For people living in the plains variety is a few types of vegetables, paddy and millets and one believes that chemical fertilizers and pesticides alone can increase the yield and protect the crops. But a visit to the annual Paata Vittanala Panduga (old seeds festival) held in the Agency area of Visakhapatnam district is a revelation. The festival has scores of varieties of paddy, millets and vegetables that are not found even in large urban markets or big villages. While the agriculture products of various colours were a pleasing sight, the important fact is that the Girijan farmer has not forgotten his traditional methods in farming. The Girijans seldom use chemical fertilizers and pesticides and organic farming is widely practised. He does not generally buy seed, but prepares them from the previous crop setting a part of it aside for sowing. Thus the crop from the yield is nutritious and healthy. This is an age old practice and in spite of polished rice, snacks like idli becoming part of the diet, Girijans still practise it. Sanjeevani, an NGO working among Girijans, with the help of another NGO Samata and CRYNET, a network of rural youth organisations, organises the old seeds festival every year at different villages. This year it was held at Panasavalasa in Dumbriguda mandal, 25 km from the famous tourist centre Araku Valley on Sunday. The NGO has bagged the Union Government's Plant Genome Saviour Community Award for 2011-12. "The old seeds festival is organised to encourage farmers to retain and to protect seeds of many varieties of high quality seeds which are facing a threat due to changing food habits and farm practices. There is also a threat to biodiversity if the seeds are not protected and promoted. Through our Paata Vittanala Pandaga we are also creating awareness among the people, NGOs and the Government", secretary of Sanjeevani, P. Devullu said. A couple of energetic and young farmers from Malingavalasa came with 178 varieties of paddy, millets and vegetables and 10 medicinal plants and farmers from other villages were keen on learning about them, for example many collected the seeds of Saatekalu paddy variety brought by farmers of Kusumguda village. US - The US Department of Agriculture (USDA) scientists and cooperators have provided knowledge about the chemical composition and potential bio-availability of nutritious compounds in a representative group of five colorful rice varieties. The findings could help breeders select for these traits from among 18,000 rice samples, called accessions, at the National Small Grains Collection in Aberdeen, Idaho. Though often thought of as white or brown, rice is categorized into seven color classes, based on bran color, and darker varieties are thought to have higher amounts of some phytochemical compounds than lighter varieties. The studies were headed by research chemist Ming-Hsuan Chen at the Agricultural Research Service (ARS) Dale Bumpers National Rice Research Center in Stuttgart, Ark. ARS is USDA's chief intramural scientific research agency, and this research supports the USDA priority of promoting international food security.